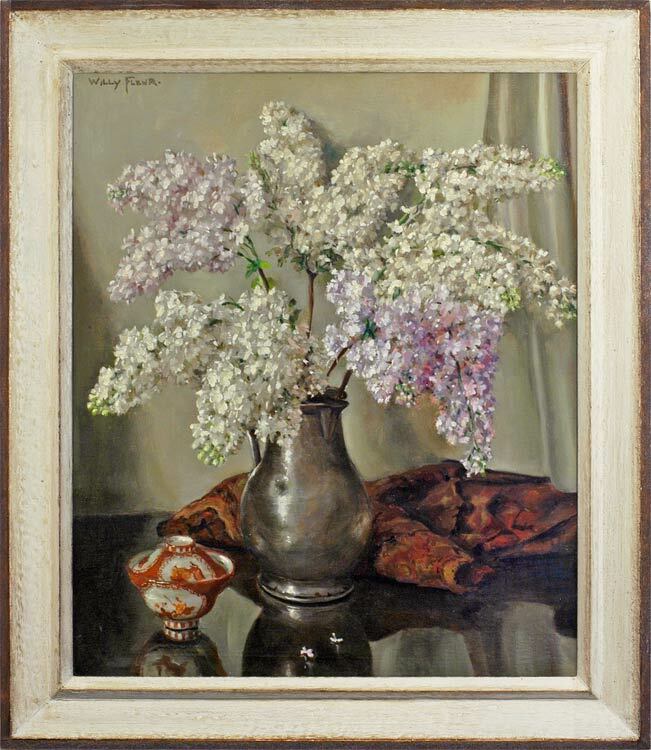 This arrangement of pale mauve and white lilac branches on a polished surface is characteristic of Willy Fleur’s flowerpieces, and displays his talent for muted colour harmonies of soft pastels and subtle gradations of tone. He tends to choose a composition centred on a vase of large, casually-arranged blooms, balanced by a piece of fabric or drapery of some sort, and a small bowl or trinket, as here. The fabric creates a contrast of texture with the reflective surface of the table, and a simultaneous complement to or harmony with the flowers. These considered and complex arrangements of colour are reminiscent of Albert Moore’s harmonies of fifty years earlier, and are one of the strongest restatements of the aesthetic principle in the first half of the 20th century. Monet’s experiments with painting the waterlilies at Giverny have also influenced this type of still life; Monet was concerned with the representation of different spatial dimensions, expressed in the surface of the water with its shadows and reflections, the transparent world beneath it, and the actual space above it. Equally, Fleur is painting the mirrored surface of the table, the arrangement above it and the reflections and shadows contained in it, and playing these varied spaces against the different materials which compose the still life – the dull gleam of the pewter vase, the glossy china bibelot, the soft crumple of fabric, and the evanescent fragility of the flowers. Johan Willem (Willy) Fleur was born in Markelo in the Netherlands in 1888, and died at The Hague in 1967. He lived and worked in Rotterdam until 1912, when he moved to The Hague; he attended the fine art academies in both cities. His characteristic flowerpieces comprise a vase of large blooms standing on a highly polished and reflective table, balanced by a piece of drapery and a small box or bowl (usually oriental in style), and are often composed in a colour harmony of subtle pastels. He was much more versatile, however, than this implies: he produced glowing studies of potted cinerarias, tanks of golden carp, greenhouse interiors, and branches of budgies and finches. The carp were painted in the conservatory of his friend, the father of Ellen Goldman-Berrington, whose childhood memories of Fleur were published in the exhibition catalogue, Willy Fleur (1888-1967): een kleurrijk Haags schilder met een Oosters hart. The friendship began when Fleur was selling his paintings from door to door during the depression immediately before WWII, at a time when many artists found it extremely difficult to make a living. Fleur seems to have taught privately, to supplement his income. As well as still life paintings, he produced landscapes, beach scenes, and townscapes; he seems to have traveled, some of his outdoor scenes depicting Africa. Works in public collections include paintings in the Westlands Museum and the Katwijks Museum.